Sriracha Baked Beans - smoked sausage, onion, chicken broth, brown sugar, apple cider vinegar Sriracha, molasses, mustard, chili powder, salt, black beans, kidney beans and pinto beans - mix together and bake. Ready in 30 minutes. They are a little sweet and smoky and a lot of delicious! Great side dish for a potluck or cook-out. These Sriracha Baked Beans would make a great addition to your 4th of July BBQ this week. 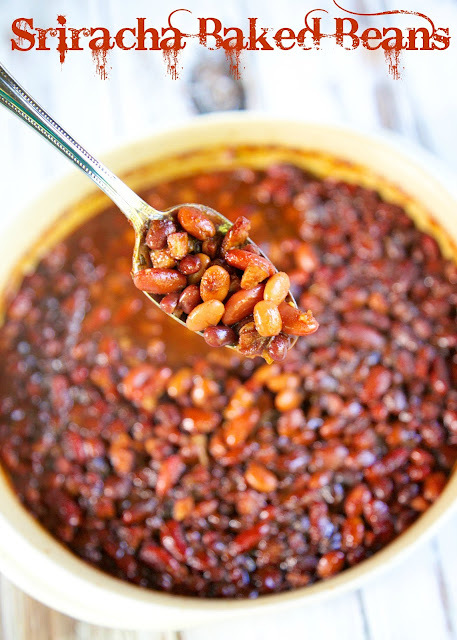 They are not your ordinary BBQ Baked Beans. This recipe has a trio of beans and packs a kick from the Sriracha. We loved them! They have a little sweetness from the molasses and some smokiness from the smoked sausage. Now, these beans do have a kick. If you are concerned about the heat, start with 1 or 2 Tablespoons of Sriracha. We like spicy food, so we did about 4 Tablespoons of Sriracha. They were just spicy enough for us! 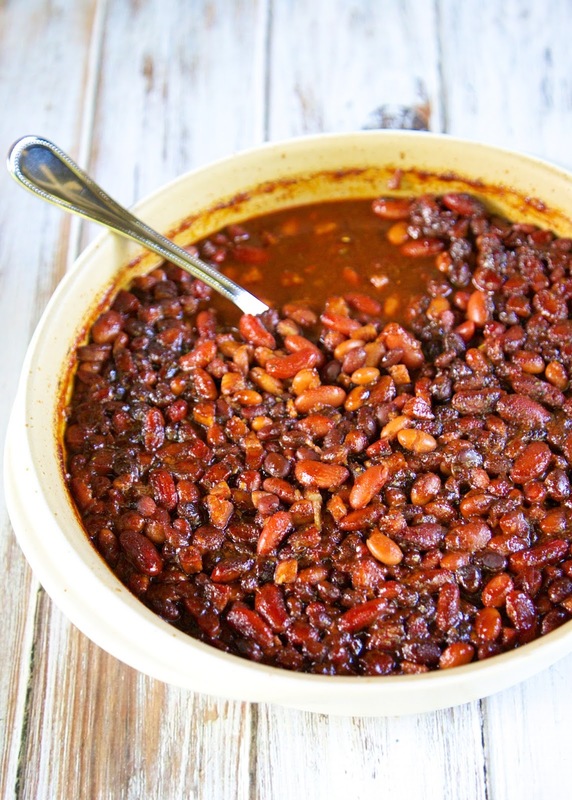 We baked these beans, but I don't see why you couldn't just cook them on the stove or even in the slow cooker. This recipe can be mixed up a day ahead of time and heated up when you are ready to eat them. Heat a Dutch oven over medium-high heat. Add hot sausage; sauté 2 minutes. Stir in broth and remaining ingredients. The sounds sound very good Steph and I can see they would have a good heat to them. Love the idea of adding Sriracha sauce into these!